The latest leg of the Genting Poker Series is in the book with a raider from north of the border showing his English counterparts how it's done. The Scot in question was Mudassar 'Macca' Hussain, who walked away with a first prize of £42,960 after outlasting a bumper field of 546 runners in Sheffield over the weekend. 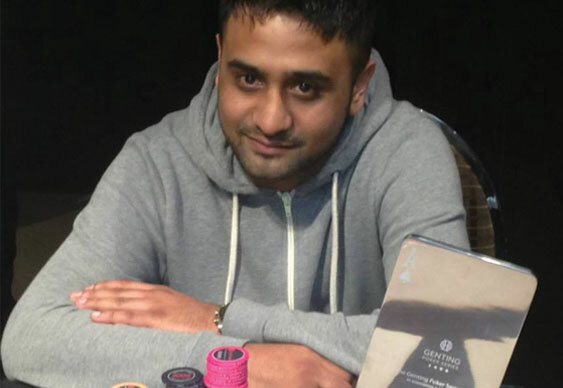 Impressive work considering that Hussain qualified online in a £55 satellite and had just 900 chips to his name when he secured his seat in Sheffield. Hussain faced tough competition for the win at a final table that included a number of notable names. Dusk Till Dawn's Simon Trumper took time out from organising next week's ISPT event at Wembley to book a sixth place finish with last year's Genting Poker Series Stoke winner Yucel Eminoglu bowing out in second. Macca sealed victory when his AK held against the 'Mad Turk's' Q8. “I am glad it’s over, but I feel great,” said Hussain. “I had to play that a little bit sensibly, but I got the job done. I knew I couldn’t give him chips or the chance to double up. Yucel got lucky once when I had 5-5 and he had K-8, and so I didn’t want to let him have too many chances. I went in to the final table pretty short stacked, but I soon realised that it was anybody’s game and I just waited in the corner and picked my spots. The GPS travels South next to a brand new venue in Southend, when Leg 4 commences on Wednesday 14th August with the first of three opening days. Day 1A will be hosted exclusively online, with day 1B and 1C in the club. Satellites will of course be running online at Gentingpoker.com, PokerEncore.com and CircusPoker.com.